Belém Tower, was built between 1515 and 1519 and is the work of Francisco de Arruda. In 1983 it was declared a World Heritage Site by UNESCO. 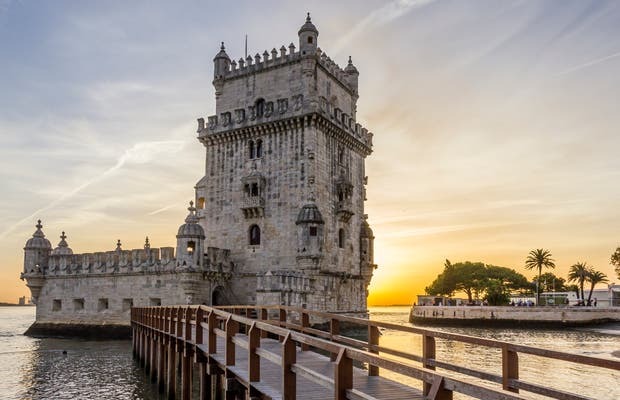 The tower is located at the mouth of the River Tagus and initially was used to protect the city before it later became a customs center and lighthouse. It is located very close to the Jeronimos Monastery and the Discoveries Monument. When visitors enter the tower on the ground floor there are 16 windows with cannons used for defence and visitors can also visit the pits and holes where the prisoners used to be kept. Inside the tower there are five floors and a terrace. If you want to go inside you will waste a lot of time; if not you can walk along the gardens and take photos of the tower from outside, it’s wonderful too. And there’s a pastry shop next to it with the same name. A must go!